Region: Annapurna Maximum Altitude: 2200 M. / 7,260 ft.
Sikles Trek is an alternative to other short treks in the region, like Ghorepani PoonHill, Poonhill Panorama Trek or Short Annapurna Circuit. The Sikles is an uncrowned corner of the Annapurna Conservation Area under the shadows of Lamjung Himal and Annapurna II and IV. This fabulous camping trek takes you about a week, starting at Beganas Tal (Lake) and heading north to the Madi Khola, then following the river’s west bank up to well-preserved Sikles (1,980m. ), Nepal’s biggest Gurung village. From here you strike westwards over the thickly forested ridge that separates the Madi and Seti Khola drainage’s and then descent via Ghachok, another Gurung settlement, to reach the Pokhara – Baglung Highway. Variations on this route are often touted as the ‘Royal Trek’, after a rally the troops swing Prince Charles took through the area in 1980 to visit the villages of Gurkha recruits. As part of an effort to develop this into a model eco trekking route. Day 01: Drive Kathmandu to Pokhara (820 m.) – 07/08 hrs. Day 02: Drive to Bijayapur Khola (30 min. Drive. )- Trek to Kalikasthan (1150 m.) – 04 hrs. Walk. Day 03: Kalikasthan to Lama Chaur (910 m.) – 05 hrs. Walk. Day 04: Lama Chaur to Sikles (1980 m.) – 06 hrs. Walk. Day 05: Explore Sikles village. Day 06: Siklis to forest Camp (2,200 m.) – 06 hrs. Walk. Day 07: Forest Camp to Ghale Gaon (2,000 m.) – 06/07 hrs. Walk. Day 08: Ghale Gaon to Hyanja (1070 m.) – 06 hrs. Walk. Drive to Pokhara – 01 hr. Drive. Day 09: Drive Back to Kathmandu by Tourist bus – 07/08 hrs. Day 01: Kathmandu to Pokhara (820 m.) – 07/08 hrs. Drive. Drive to Pokhara through Prithivi Highway by private tourist vehicle or tourist bus. Pokhara is a clean and beautiful city because it is less polluted and crowded compared to Kathmandu. We get great views of Annapurna range, Lamjung himal range including dominating figure of Machapuchher (Fishtail) and Phewa Lake with its reflection in it. Then the afternoon can be enjoyed by the lake, as the hotel is located near to the lake. Stay overnight at Hotel. A 30 minute drive to Bijayapur Khola (Bijayapur Army Camp) takes us to the starting point of the trek. The route takes us through agricultural fields then ascends through Rakhigaon. Then the trail gently climbs along a ridge top through the Brahmin and Chhetri villages towards Kalikasthan. Drive from Pokhara to Bijaypur Khola than trek to Kalikasthan (1,370 m./4,500 ft.) 05 hours. Today the trekking will be through into the local village of Chhettri. During the trek, you will see best views of Begnas Tal and Pokhara valley. Overnight at Camp. After the himlayan breakfast at the lodge, today you will start your trek further to Sikles, the final destination of you trek. The trail ascends to Sikles throughout the thick forest of Rhododendron. This is the second largest Gurung village. Sikles is the finest point from where you can view the scene of Himalayan and close up vision of Annapurna II, Lamjung Himal and Manaslu. Trek from Siklis to Neuli Kharka or Forest camp (2200 m.) which takes about five hours. This trek goes through rhododendron and oak forests following gently ascent path in the beginning. After some distance, you walk over the flat land. Forest Camp is surrounded by forests. Trek from Forest Camp to Ghale Gaon (2000 m.) and it takes about five hours. You trek through forests covered with rhododendron. While walking you cross the highest pass of this trek. After pass, you descend steeply to reach Ghale Gaon. 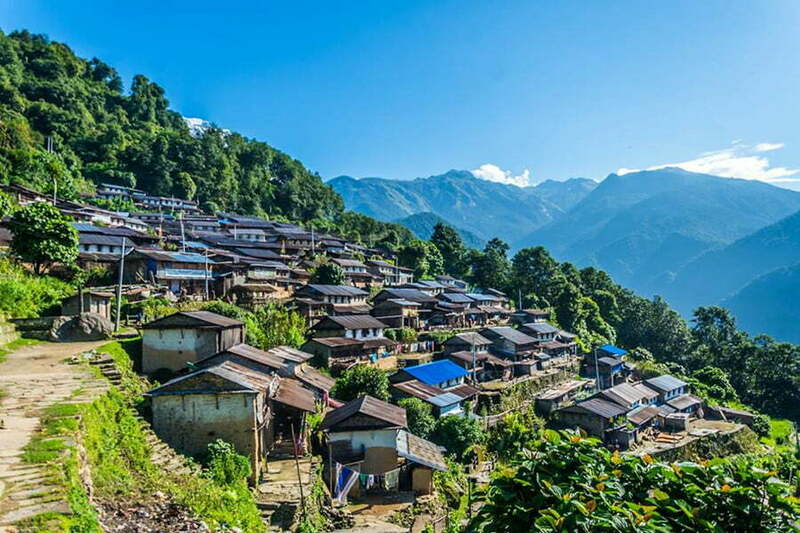 It is a small village which is mainly inhabited by Gurung and Magar community. Day 08: Ghale Gaon to Hyanja (1070 m.) – 06 hrs. Walk. Then Drive to Pokhara – 01 hr. Drive. After having a breakfast we trek down to Hyanja, which is going to be the end of our trek. We then drive half an hour to reach Pokhara. Day 09: Back to Kathmandu by Tourist bus – 07/08 hrs. Drive. ☛Transportation for Kathmandu / Pokhara / Kathmandu by Tourist Coach. ☛Accommodation (2 persons per room) in Pokhara with breakfast. ☛Half day sightseeing in Pokhara and necessary transport and Guide. ☛Drop to Bijayapur Khola (trekking starting point), and pick up from Hyanja to Pokhara. By Private tourist vehicle. ☛TIMS (Trekking information management system) Fee. ☛Lodge trek with all meals (breakfast, lunch and dinner) and accommodation in tea house lodge. ☛Accommodation, meals, transportation, equipment’s, and allowances of guide and porter. ☛Insurance of Guide and Porters. ☛All applicable government taxes and service charge. ☛Any accommodation, meals and other services in Kathmandu. ☛Lunch and dinner in Pokhara. ☛Entry fee at the sightseeing sites. ☛Expenses of personal nature such as tips for guide, porter and driver,laundry, bar bill, Telephone calls etc. ☛Any airfare and departure airport tax. ☛Any other cost not mention above in cost includes.